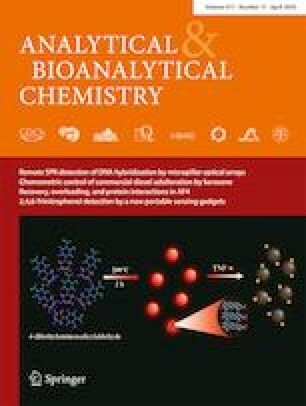 Here, we report an ultrasensitive colorimetric method for determination of Ag+ based on gold nanoparticle (AuNP) oligomers with dark-field microscopy. In a proof-of-concept trial, two cytosine-rich (C-rich) aptamers as the sensing elements and AuNPs as the transducer to produce the detectable signal are designed for Ag+ determination. Obviously, the C bases in the two aptamers play a crucial role in the coordination of highly specific C–Ag+–C. 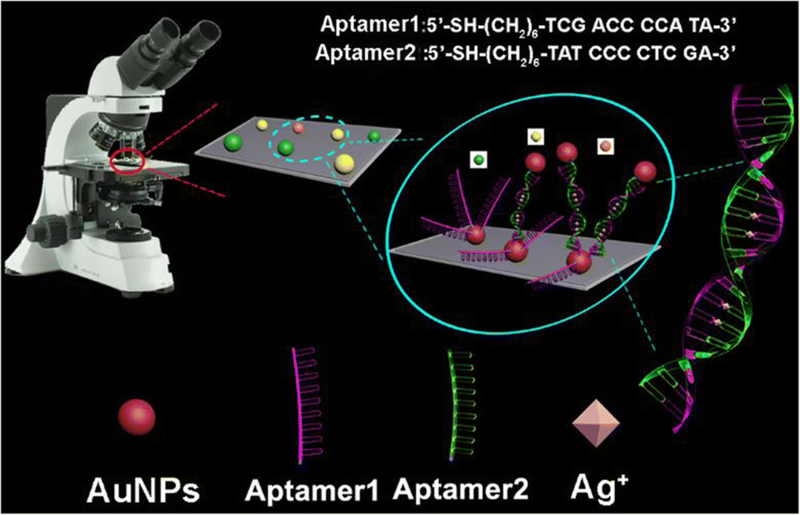 Through a specific C–Ag+–C coordination, one aptamer immobilized on the surface of AuNPs sitting on a glass slide hybridizes with the other aptamer in the solution, which triggers the formation of AuNP oligomers. The formation of plasmonic oligomers results in an obvious increase in the number of yellow and red spots in dark-field images, further leading to a significantly enhanced scattering intensity. By measuring the intensity change of AuNP oligomers in the dark-field images, the concentration of Ag+ can be readily determined. The limits of detection (LODs) of 0.246 pM and 0.388 pM in solution and river water sample were obtained, respectively. This ultrasensitive colorimetric approach could be extended to probe Hg2+ via T–Hg2+–T coordination in environmental samples.